A day spent in London walking, looking, watching and photographing when encounters with people bring humour, joy and amazement. And the 'Ghost Forest' is an amazing sight. 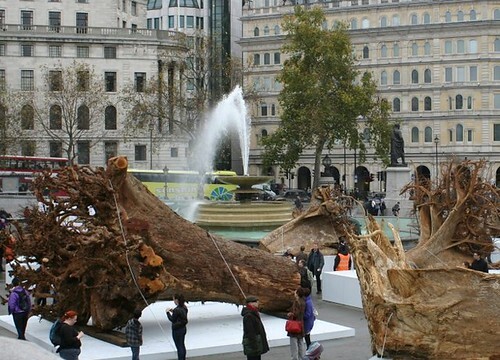 Brought to London for just one week by the artist Angela Palmer, the installation consists of huge rain forest stumps positioned around Trafalgar Square. It was really worth the visit, both beautiful and thought-provoking. 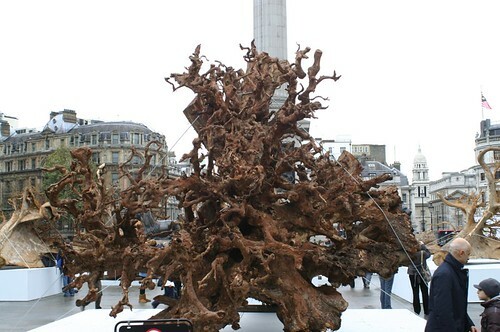 You can find out more about the Ghost Forest on Angela Palmer's website here. And there are some more photos on my flickr stream here if you don't have a chance to visit yourself. Whilst reading and pondering the trees, my eyes caught (but my camera was not quick enough for) a crocodile of japanese business men in ill-fitting suits weaving across Trafalgar Square between the trees perceiving them as obstacles, each clutching a small camera at arms-length and eye-level recording their every step for posterity. I wondered if they were actually seeing anything around them and whether they would ever watch back their films to experience everything they missed. 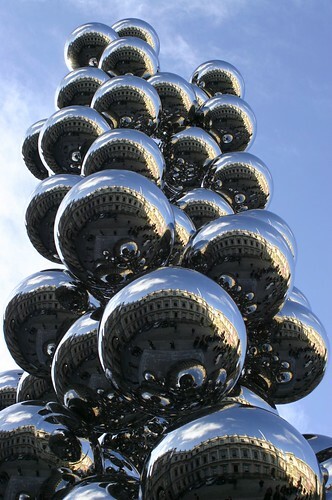 A stroll across Picadilly Circus and down Picadilly lead to the RA with the aim of visiting the Anish Kapoor exhibition. Now comes a note to self - get there as early as possible and get in the queue. If you don't, the queue will just get longer and longer all day, we are planning another visit before the 11th now I have queue tactics! A quick pit stop on Brewer Street for sushi lead us across Piccadilly Circus and into Soho. 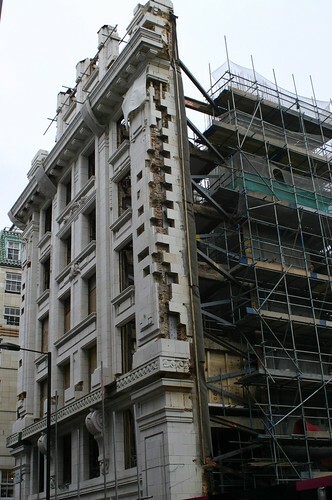 I was sad to see that the historic Windmill Theatre site has been razed to the ground but relieved to see that elements of the frontage on all 4 sides have been retained. I am always reminded of blitz photos when I see gaping holes in my familiar London streetscape - not because I was there (! ), but because the hastily re-filled gaps stood out to me quite shockingly when I was a small child. Then I stuggled to understand the stark modern structures juxtaposed between the ornate 18th and 19th century terraces. 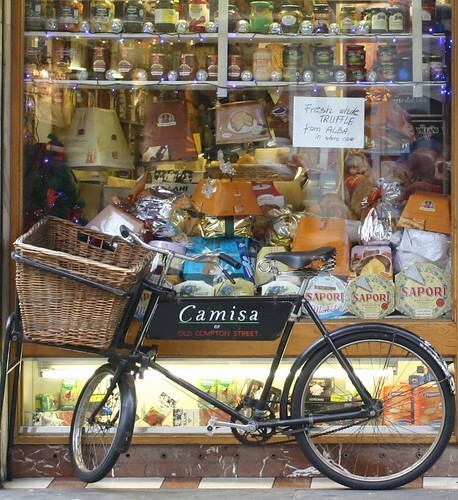 I grabbed the opportunity to photograph some of the few remaining food shops in Soho. I managed to miss Lina Stores but Camisa, Gerry's & Vintage House are all still there along with Patisserie Valerie. 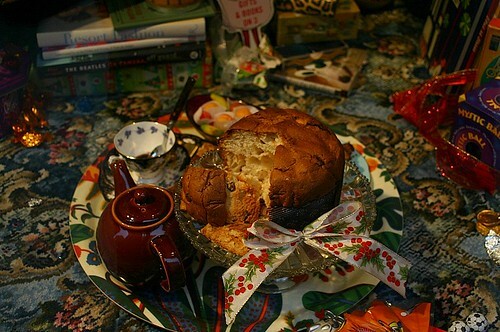 In a previous post I mentioned my Aunty Vera who was brought up living in Soho pre- & post-war. I love the fact that these few shops like Lina and Camisa have changed so little since this was her home. I didn't really have a food shopping head on, as i am still so limited in what I can eat but I am still kicking myself for missing the truffles from Camisa. Across the road Gerry's window as ever was attracting attention from passers by. 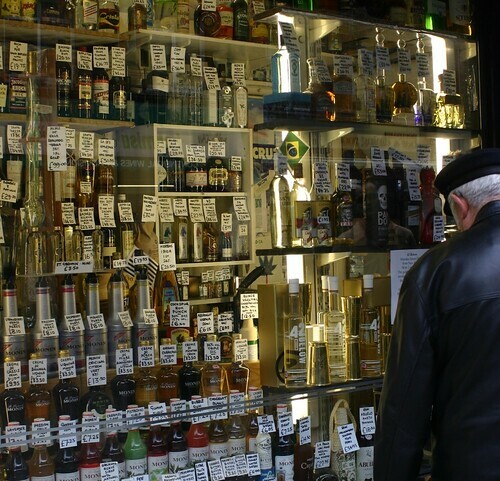 I can stare and read and imagine the flavours of the different spirits and blends just like every one else, and not notice an hour slip. Liberty's window displays are as stunning as ever this Christmas. 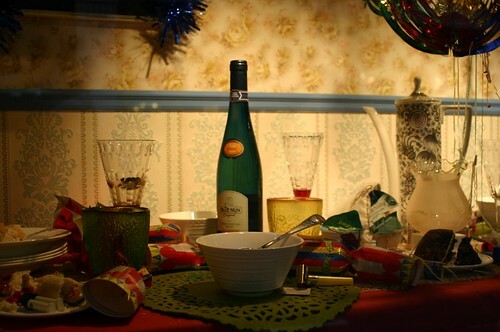 I was interested to see the complete rejection of stark style & beauty in favour of kitsch home scenes with a scale that reminded me of my grandpa's 2-up 2-down in Lancashire in the 1970s. I loved the pantomime dames too. A final stroll down Regent Street passing below the under-stated Christmas lights though I was looking for the giant spider which surely accompanies them, and back down to Trafalgar Square. I love the scale of the National Gallery and especially the Sainsbury wing. It took a while for it to grow on me, but now I love its' cavernous scale, graphic reworking of 18th century architectural finishes and stark lines. 'The Sacred made Real' is an exploration of the 16th century Roman Catholic iconography which is found mostly in the churches and monasteries of southern Spain. These are the figures that make up the tableaux which are venerated as they procession around the towns in Holy week leading up to Easter each year. I have seen these figures in churches across Europe but had never pondered on how or when they were created. Without thinking about it too deeply I realise that I had come to the conclusion they were 1950s shop mannequins! How far was I from the truth. This was also (& I have no good reason for this) the first exhibition that I had viewed with a really good audio guide which brought life and understanding to these surreal figures and paintings: I definitely recommend a visit. And that's it, a quick wander round West One to try out a borrowed camera.